If tahini is made with hulled and ground sesame seeds, you may think you'll find it next to the nuts and seeds. However, understanding what it is and how it is packaged will give you a better understanding of where it is located at your local grocery. Tahini is a thick paste used as a condiment and ingredient in Middle Eastern cooking. Ah ha! Two clues - Middle Eastern and a condiment. Most major grocery stores today stock staples from nearly every ethnic cuisine in an area often referred to as the international aisle. Smaller stores or stores in more rural areas might not stock tahini. If there are few or no people of Middle Eastern descent living in an area, the call for stores to stock tahini could be slim to none. Gourmet stores usually carry it, and if you can find a Middle Eastern specialty grocer, all the better. Your third clue as to where to find it is to know how it is sold. Ready-made tahini is sold in jars, cans or tightly covered plastic containers and is shelf stable until opened, but some stores might stock it in the refrigerated or freezer section. Tahini mixes to be finished at home made by companies like Whole Spice can be found in the Middle Eastern section with other dry mixes. Since tahini is a component of the chickpea spread known as hummus bi tahina, you might find it next to a hummus mix or ready-made on the shelf, in the refrigerator or freezer. You also might find it near the rice. Stores vary in how and where they present certain unusual ingredients, so you might need to hunt around a bit. Check near the condiments, in the international aisle, and the refrigerator section. If it's not in those sections, don't be afraid to ask where to find it. If you can't find tahini in the grocery store, it's simple enough to make at home. Raw sesame seeds, the main ingredient, can be found among other raw nuts and seeds in the bulk section, organic section or baking-ingredient section of a run-of-the-mill grocery store. If you still can't find them at a regular supermarket, try a health-food store or a trendy market like Whole Foods, Mariano's or Trader Joe's. Remember, you want raw sesame seeds because you'll be doing the roasting yourself. All you need for this easy two-ingredient recipe is an oven and a food processor. Spread the raw sesame seeds onto one or more baking sheets so they are in a flat layer. Toast for 10 minutes, shaking the pan occasionally to flip the seeds over so they toast evenly. Remove the seeds from the oven and let them cool completely. Place cooled toasted sesame seeds in a food processor with the olive oil. Process for about two minutes or so until the consistency is thick but not too thick. Tahini should pour easily into a container. Tahini is best fresh, so use it immediately if you can. It can be stored at room temperature, but once the container is opened, it should be refrigerated so that the oil from the sesame seeds does not go rancid. Alternatively, store it in an airtight container in the refrigerator for up to a week or freeze for longer storage. Try making tahini sauce for your next falafel or pita sandwich by mixing 1/2 cup tahini with 3 cloves pressed garlic, 1/2 teaspoon kosher salt, 2 tablespoons olive oil, 1/4 cup lemon juice, and 1 teaspoon finely chopped parsley. Baba ghannouj (also spelled baba ghanoush) is another popular dip besides hummus that is made with tahini. Roasted eggplant is combined with lemon, garlic and more olive oil for a great meze or appetizer-spread offering. Tahini can be used to thicken soups and sauces, added to creamy vinaigrettes for salad, used to replace the mayo in deviled eggs and on sandwiches, in brownies, cookies, and vegan desserts where it can replace the butter. Use it as you would use peanut butter by spreading it on toast with honey. Or try it on a baguette with a sprinkle of sea salt and a dab of roasted garlic. 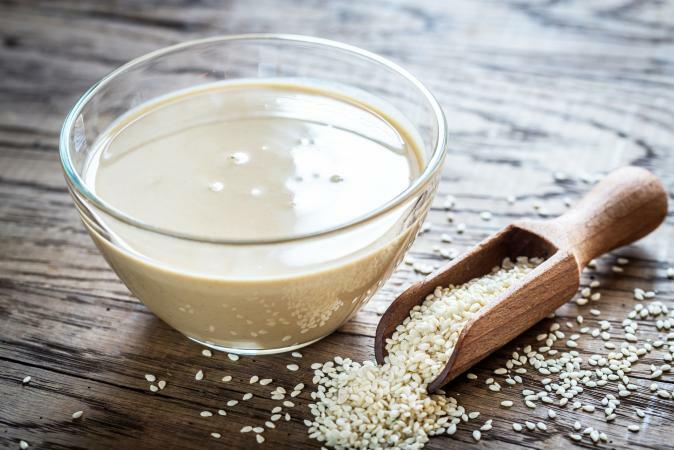 Whether the tahini is homemade or purchased, you can turn this wonderful sesame seed paste into a myriad of delicious foods. It works on its own as a sauce or spread or when incorporated into other ingredients. Tahini is a blank canvas on which to paint a culinary masterpiece. Go forth and create!